Starting with the first Battle of Bull Run, the United States Marine Corps took part in several significant battles on land and at sea during the Civil War. On the morning of October 17, 1859, an aide to Secretary of War John B. Floyd hurried off with an urgent message for Colonel Robert E. Lee. Floyd had just received word that the federal arsenal at Harpers Ferry, Virginia, had been seized by a group of antislavery zealots led by the notorious terrorist John Brown. Floyd was ordering Lee to come to Washington (he was on leave at his home in Arlington, just across the Potomac River) and take command of the force being sent to Harpers Ferry to retake the arsenal and restore order to the community. Also home on leave that morning was a young cavalry officer from Virginia, 1st Lt. James Ewell Brown Stuart, nicknamed “Jeb,” who had been waiting for some time to see Floyd. The aide convinced Stuart instead to ride over to Lee’s home and deliver the peremptory orders. Floyd needed to scrape together a body of soldiers for Lee to lead to Harpers Ferry, a daunting task since no Army troops were readily available. President James Buchanan, normally a procrastinator, immediately realized the seriousness of the situation and demanded quick action. Secretary of the Navy Isaac Toucey jumped at the chance to get involved, telling his chief clerk, Charles W. Welsh, to ride over to the Washington Navy Yard and see how many Marines could be mustered for duty. Upon arrival, Welsh spoke with 1st Lt. Israel Greene, temporarily in charge of the Marine barracks. Welsh told the young Marine officer what had transpired at Harpers Ferry and directed him to gather as many men as he could for duty. Although Greene was the senior line officer present, Major William Russell, the Marine Corps paymaster, accompanied the detachment of 86 leathernecks. Working with the major, Greene saw to it that each of the 86 men drew a full complement of muskets, ball cartridges, and rations. Since no one knew for certain the strength or exact position of the insurgents, two 3-inch howitzers and a number of shrapnel shells were also made ready. At 3:30 pm, Greene and his Marines set off by train to Harpers Ferry. At 10 that evening, Lee and Stuart linked up with Russell and Greene at Sandy Hook, Maryland, just across the Potomac from Harpers Ferry. After a botched attempt at taking over the town and inciting a slave rebellion, Brown and his polyglot force had seized hostages and taken refuge inside a small brick engine house on federal property. The Marines marched to Harpers Ferry, entering the arsenal grounds through a back gate. About 11 pm, Lee ordered the various volunteer units out of the grounds, clearing space for the only regular troops at his disposal—the Marines under Greene. Brown’s raid on Harpers Ferry and his subsequent execution added fuel to the already simmering political fire that separated North and South. In little more than a year, with the election of Abraham Lincoln to the presidency, South Carolina would secede from the Union, followed by six other Southern states. With the firing upon Fort Sumter in Charleston harbor, the nation would be torn apart by civil war. So, too, would be the United States Marine Corps, 20 of whose officers resigned their commissions to take up arms against the government, including fully one-half of all line officers ranked from first lieutenant to major. 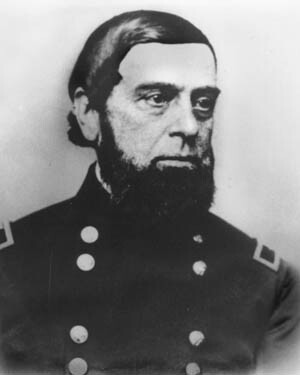 Greene, pictured after the war, resigned his commission and joined the Confederate Marine Corps. 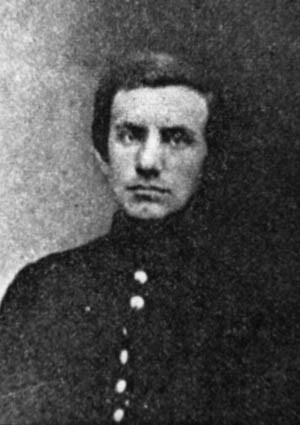 Second Lieutenant Robert Hitchcock, also took part at Harpers Ferry. He was killed at Bull Run. Reynolds, at least, was well chosen for the task. A Mexican War veteran with 35 years of military service, he knew instinctively what to expect. The same could not be said for the troops under him. Twelve noncommissioned officers commanded the four companies, which included 324 privates. Three musicians and one apprentice music boy were also assigned. Some were enlisted as recently as July 8 and had less than a week’s drill under their belts. The majority of the battalion had enlisted during May and June. Only seven privates had been in the Corps prior to the opening gunfire at Fort Sumter, and only 16 men had seen any active service. Under Reynolds and his second in command, Major Jacob Zeilin, the 350-man battalion left Washington to participate in the looming battle. As Reynolds’ battalion marched through the nation’s capital, the men were cheered and applauded as the saviors of the Union. After crossing the Long Bridge across the Potomac into Virginia, the battalion swung in behind Captain Charles Griffin’s battery of flying artillery, known as the West Point Battery. There they linked up with the Army of Northeastern Virginia, the largest field army ever gathered in North America. It was led by Brig. Gen. Irvin McDowell a staff officer who had never commanded troops in combat. McDowell’s plan was to move westward in three columns and make a diversionary attack on the Confederate line at Bull Run with two columns, while the third column moved around the Confederates’ right flank to the south, cutting the railroad to Richmond and threatening the rear of the enemy army. He assumed that the Confederates would be forced to abandon Manassas Junction and fall back to the Rappahannock River, the next defensible line in Virginia, which would relieve pressure on the U.S. capital. Reynolds’ battalion was incorporated into the 16th U.S. Infantry, part of a brigade commanded by Colonel Andrew Porter. “The marines were recruits, but through the constant exertions of their officers had been brought to present a fine military appearance, without being able to render much active service,” wrote Porter. “They were therefore attached to the battery as its permanent support through the day.” In this way, Porter sought to lessen the likelihood that the Marines would see much, if any, fighting that day. 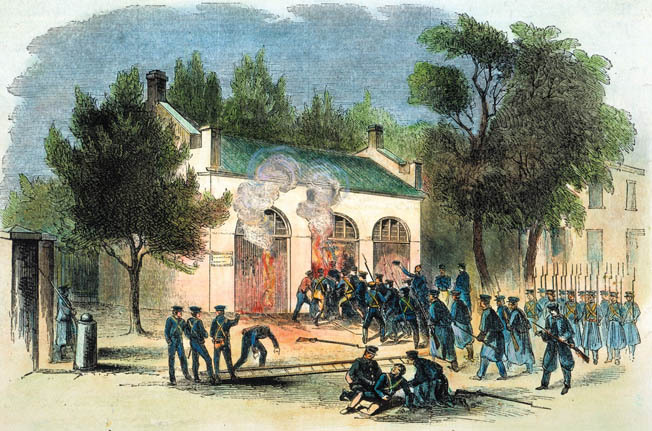 Marines led by Lieutenant Israel Greene storm the engine house at Harpers Ferry, Virginia, where terrorist John Brown was holed up. The untried McDowell led his unseasoned Union army across Bull Run against the equally inexperienced Confederate Army of Brig. Gen. P.G.T. Beauregard. His plan depended on speed and surprise—two elements that were sorely missing in his grass-green army. To begin with, the march south took twice as long as expected, owing to a mix-up in the issuing of rations. Columns soon became hopelessly disorganized; several regiments lost their way in the dark. Reynolds’ Marines found themselves facing an unexpected challenge: the artillery unit to which they had been attached contained six horse-drawn cannons, which raced ahead of the marchers at every opportunity. As Reynolds reported later: “The battery’s accelerated march was such as to keep my command more or less in double-quick time; consequently the men became fatigued or exhausted in strength.” The sweltering July temperatures added to the Marines’ tribulations. Crossing Bull Run at Sudley Ford, Brig. Gen. Ambrose Burnside’s Union brigade fell on the Confederate left, held only by Colonel Nathan “Shanks” Evans’ under-strength brigade. Griffin’s battery, followed closely by the Marines, splashed across the creek and opened fire from a range of 1,000 yards. The Confederates found themselves at an initial disadvantage, but the inexperienced Federal troops soon buckled under the intense firing and began to fall back. Porter’s brigade, including Griffin’s battery and the Marines, held firm, but the arrival by train of Confederate reinforcements led by Brig. Gen. Joseph E. Johnston quickly changed the course of the battle. A brigade of Virginians under a recently promoted brigadier general from the Virginia Military Institute, Thomas J. Jackson, rallied at Henry House Hill. 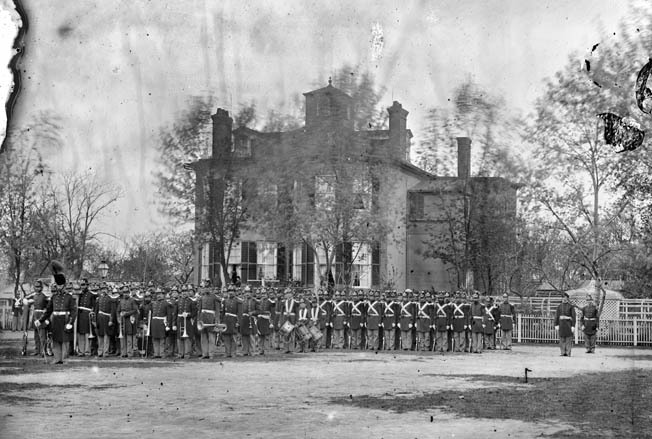 A well turned out battalion of Marines parades past the Commandant’s House in Washington in 1864. Band members are pictured at left, with drummer boys in the center. To be fair, there were extenuating circumstances, most particularly the disastrously short amount of time the Marines had had to train before being rushed to the front. Nevertheless, as the least experienced soldiers in McDowell’s woefully inexperienced army, the Marines gave a reasonably good account of themselves under fire, and their 13 percent casualty rate was nearly equal to the Regular Army battalion, the most experienced unit in the Federal army at Bull Run. Following Bull Run, Congress only slightly enlarged the size of the Marine Corps due to the priority given to the Army and after filling detachments for the ships of the Navy (which had more than doubled in size by 1862), the Marine Corps was only able to field one battalion at any given time. Marines from ships’ detachments as well as ad hoc battalions took part in the landing operations necessary to capture bases for blockade duty. These were mostly successful, but an amphibious landing to seize Fort Sumter in Charleston harbor in September 1863 would be another story. By the summer of 1863, the Charleston defenses had continued to withstand any Union offensive. 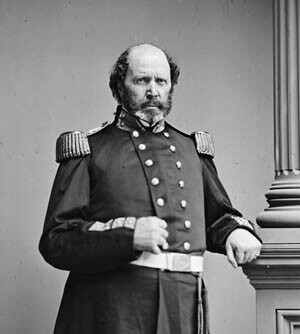 Rear Admiral John A. Dahlgren replaced Admiral Samuel Du Pont as commander of the South Atlantic Blockading Squadron and proposed a joint Navy-Army-Marine assault to seize outlying Morris Island and then move on Fort Sumter itself. He asked Secretary Welles for an extra battalion of Marines to be combined with another battalion assembled from those already serving in the fleet to form an assault regiment. Harris, in turn, put together a motley assemblage of troops—anyone he could grab, including recruiters, transients, and the walking wounded—and placed the now recovered Zeilin in command. Dahlgren and Army Brig. 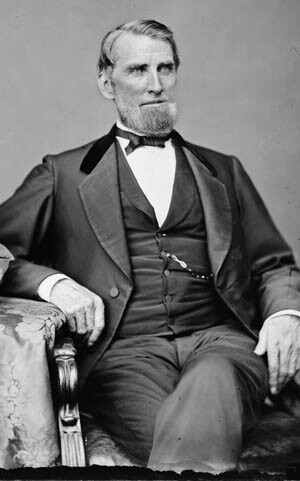 Gen. Quincy A. Gillmore, agreed to begin the campaign by seizing Fort Wagner on Morris Island. Union gunners made use of a new piece of artillery known as the Requa gun—25 rifle barrels mounted on a field carriage used for rapid firing. On July 10, Gillmore’s soldiers landed safely on the far side of the island, but the subsequent overland attack the next day met with a bloody repulse. One week later, Massachusetts-born Colonel Robert Gould Shaw led a doomed assault on Fort Wagner spearheaded by the African American 54th Massachusetts Infantry. Shaw and 54 of his men were killed, and another 48 were never accounted for. Other Union regiments from Connecticut, New York, and New Hampshire fared no better. Gillmore called off the all-out attack and ordered his engineers to dig a number of zigzagging approach trenches. While they dug, calcium floodlights, another military novelty, were flashed at the defenders, blinding them enough to prevent accurate return fire. But the ground the Union soldiers were digging through was shallow sand with a muddy base. 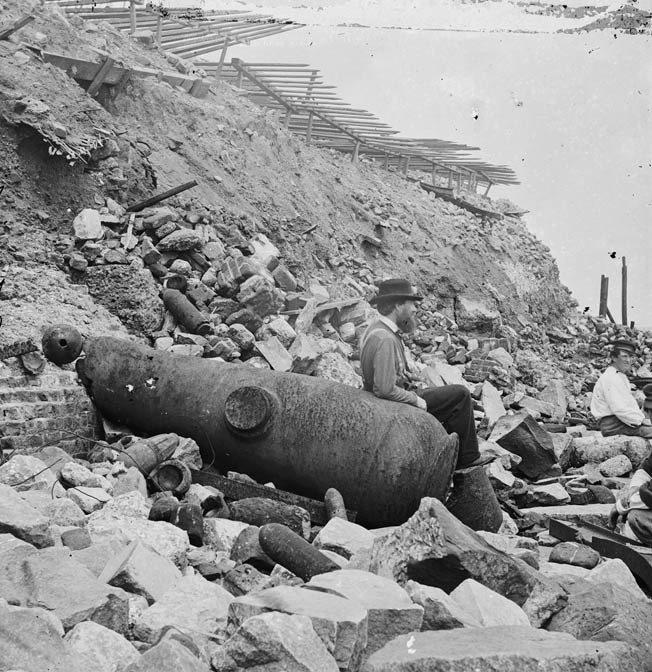 The trenching efforts also began to uncover the badly decomposed Union dead from the previous assaults on Fort Wagner. Disease and bad water plagued the soldiers as well. Colonel John Harris was Marine Corps commandant when the Civil War began. Dahlgren planned for Zeilin’s Marines to make a landing and support the Army soldiers already on shore, but Zeilin surprisingly objected. He claimed his force was “incompetent to the duty assigned it. Sufficient sacrifice of life has already been made during this war, in unsuccessful storming parties, to make me anxious at least to remove responsibility from myself.” Zeilin also complained that many of his Marines were raw recruits and that it was too hot to train them. “No duty which they could be called upon to perform requires such perfect discipline and drill as landing under fire,” he said. A furious Dahlgren cancelled the Marine landing, recording in his diary: “The Commander of Marines reports against risking his men in attacking [enemy] works. What are Marines for?” Subsequent historians have rebutted Zeilin’s claim that his men were inexperienced, noting that 60 percent of the new Marine battalion and 90 percent of the fleet battalion had at least a year’s experience. When Zeilin fell ill, Captain Edward M. Reynolds (the son of Lt. Col. George Reynolds of Bull Run fame) took command of the battalion. After the Confederates’ surprise evacuation of Fort Wagner, Dahlgren moved swiftly to attack Fort Sumter, ordering an attack on the fort on the evening of September 8 by 500 Marines and sailors in 25 small boats led by Navy Commander Thomas H. Stevens. Dahlgren learned at the last moment that Gillmore was planning a separate boat attack on the fort that same night. Attempts to coordinate the attacks faltered over the question of whether the Army or the Navy would exercise ultimate command of the assault. The assault ground to a halt within 20 minutes. The 105 surviving Marines, unable to reach the parapets or withdraw to sea in their now splintered boats, surrendered. Meade spent the next 13 months in a Columbia, South Carolina, prison camp. Twenty-one enlisted Marines, less fortunate, died in captivity at the notorious Confederate prison at Andersonville, Georgia. Major Jacob Zeilin, wounded at Bull Run, became commandant in June 1864. By the fall of 1864, Maj. Gen. William T. Sherman and his army of more than 60,000 men had taken Atlanta and headed east across Georgia toward the sea. In a telegram to Army Chief of Staff Henry W. Halleck, Sherman advised: “I would like to have [Maj. Gen. John] Foster break the Charleston-Savannah Railroad about Pocotaligo about the 1st of December.” On November 30, at the Battle of Honey Hill, also known as Boyd’s Neck, Foster failed in his attempt to sever the railroad. At dawn on December 6, a combined force of Marines, sailors, and soldiers landed on Gregorie Point, South Carolina. “We advanced on the right of the Naval Battery and came under fire about 11 a. m., deployed the whole battalion as skirmishers on the right, and advanced into the woods beyond Tulifinny cross roads driving the enemy before us,” wrote Stoddard. Union troops captured the Gregorie Plantation home, quickly moved toward the Charleston-Savannah Railroad, and surprised the 5th Georgia Infantry, capturing its colors. A corps of 343 Citadel cadets, bivouacking four miles away, heard the fire and marched at a run to Gregorie Point. In the early morning hours the next day, the cadets and three companies of Georgia infantry mounted a surprise attack on the center of the Union position. Marines were in the center of the Union line, supporting the Army and Navy field artillery batteries. As the cadets slowly inched their way forward, they were met by withering musket fire. Cadet Private Farish C. Furman, a 19-year-old sophomore, later wrote of seeing “a stream of fire shoot out from the bushes in front of me, accompanied by the sharp crack of a rifle. The ball fired at me missed my head by a few inches and buried itself in a tree close by.” The cadets returned fire and mounted a bayonet attack aimed at the Union line, but were quickly forced to retreat. Union forces prepared to counterattack. As the bluecoats emerged from a swampy, heavily wooded area, they began running across the open field toward the cadets, traversing “a dense swamp, from knee to waist deep.” It was so thick, Stoddard reported, “that you could not see a man three or four paces from you.” The Citadel cadets lifted their rifles and filled the air with Minie bullets. After suffering many casualties, Union troops withdrew to their trenches. 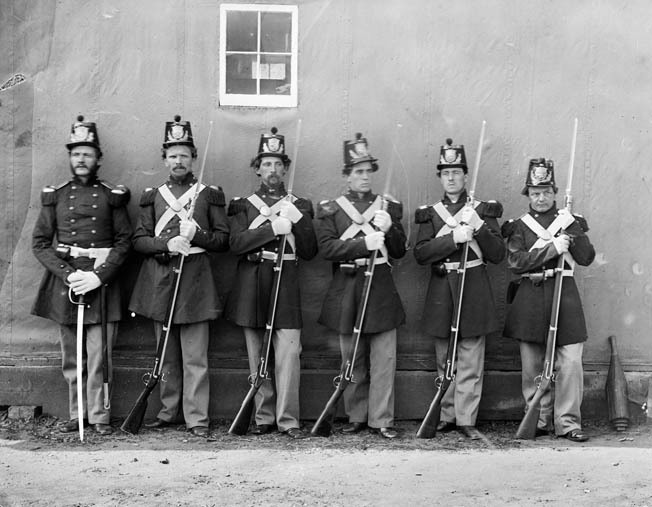 A Marine officer in full dress, far left, proudly shows off his troops in this 1862 photo by famed photographer Mathew Brady. On December 9, Union forces made a final assault against the Confederate defenses. The Marine battalion formed on the far right of a 600–man skirmish line. To the right of the Marine battalion was the Tulifinny River. The cadets were camped directly ahead of the Marine position. Stoddard’s men came within 50 yards of the railroad tracks near the river before the 127th New York Volunteers on their left began to retreat. The Marines on the extreme right continued forward. Stoddard reported: “I found myself unsupported and nearly cut off. I faced my men about, but having no means of telling proper direction, kept too much to the right and struck the Tulifinny River. This turned out to be fortunate, as the enemy pursued our left and through the river, taking several prisoners. We have lost in killed, wounded and missing 23, a list of whom I send herewith. The non-commissioned officers and privates have all behaved in a most gallant manner and I am sure that by their bravery they added to the high reputation the Corps already enjoys.” Despite the failed attack, Stoddard was promoted to captain. The Marines suffered another embarrassing failure a few weeks later at the Battle of Fort Fisher. The fort, located at the mouth of the Cape Fear River at Wilmington, North Carolina, safeguarded the Confederacy’s last operational Atlantic port. Shaped like an “L,” the earthen stronghold mounted 39 large-caliber guns augmented by numerous mortars. It was said to be stronger than the celebrated Fort Malakoff at Sebastopol in the Crimea. Walls nine feet high and 25 feet thick waited to repel any invader. 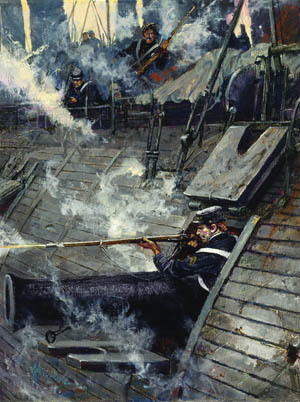 Corporal John Mackie fires from a gun port aboard USS Galena in this Charles Waterhouse painting. On the morning of December 14, a fleet of 75 Union warships and transports commanded by Admiral David Dixon Porter steamed south from Hampton Roads, Virginia, toward Fort Fisher. Troopships held 6,500 army troops under Maj. Gen. Benjamin Butler. Delayed by a storm, the Union armada began bombarding the fort on December 24. A staggering 20,000 shells of all calibers streamed across the water from Porter’s vessels. A landing party of 2,500 soldiers came ashore on Christmas Day but could only reach to within 75 yards of the fort before being driven back. Butler hastily called off the attack. That night, Porter withdrew the fleet out of range of Fort Fisher’s artillery. On January 6, Porter launched a second invasion. This time the infantry was commanded by Brig. Gen. Alfred Terry; the disgraced Butler had been sacked. A vicious storm off Cape Hatteras again delayed the flotilla, but an 8,000-man landing force went ashore one week later. There followed two more days of intense naval bombardment, while detachments of sailors and Marines gathered for an amphibious assault. Sixteen hundred sailors, armed with cutlasses and revolvers, moved ashore, accompanied by 400 Marines divided into four companies under the command of Captain Lucien L. Dawson. Naval Commander Randolph Breeze led the overall attack. 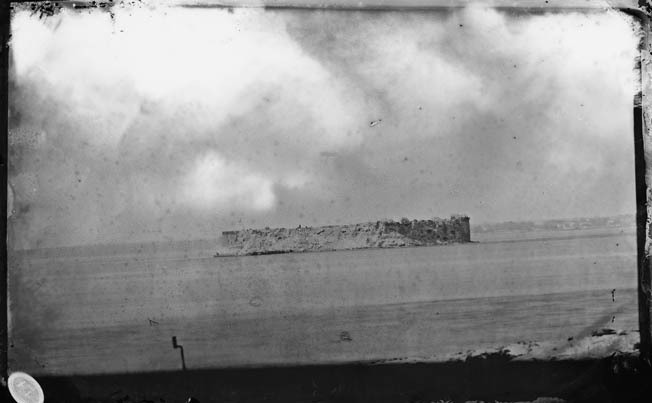 Charleston’s Fort Sumter, pictured in August 1863, was much fought over by Union and Confederate forces throughout the Civil War. U.S. Marines took a turn at capturing the fort. The assault boats soon ran aground in the rough surf, and the sailors and Marines jumped into the waves with grapeshot and shrapnel whizzing around their heads. A few hundred yards from the fort, the landing party occupied previously dug rifle trenches and waited for the signal to mount a frontal assault. The signal came shortly before 3 pm. The sailors, supported by the Marines, moved out in a single line, heading for a huge hole in the fort’s palisades that the naval bombardment had created. From the start, it was a bloody fiasco, “sheer, murderous madness,” young Navy Lieutenant George Dewey observed from the deck of the steam frigate USS Colorado. Dewey’s own day of glory was coming 34 years later at the Battle of Manila Bay in the Spanish-American War. The wreckage-strewn site of the Marines’ failed landing at Fort Sumter on September 8, 1863. Some 21 Marines later died at Andersonville prison. When the attackers were driven back, Dawson rallied two companies of Marines to provide cover fire. Several Marines spontaneously joined the Army attack on the main parapet early that evening and helped overrun Fort Fisher. Four hundred of the Confederate defenders were killed or wounded, and more than 2,000 were taken prisoner. Terry’s force lost 900 casualties, and the joint Navy-Marine force lost an additional 200, including 14 Marines killed and another 46 wounded or missing. Six Marines were awarded the Medal of Honor for their actions at Fort Fisher. 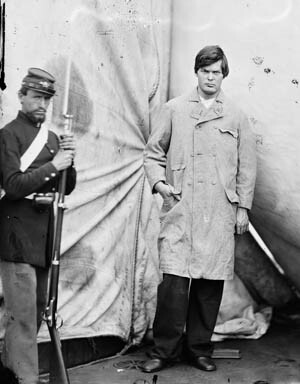 Prisoner Lewis Paine, who attempted to assassinate Secretary of State Henry Seward, is guarded by a Marine at the Washington Navy Yard. 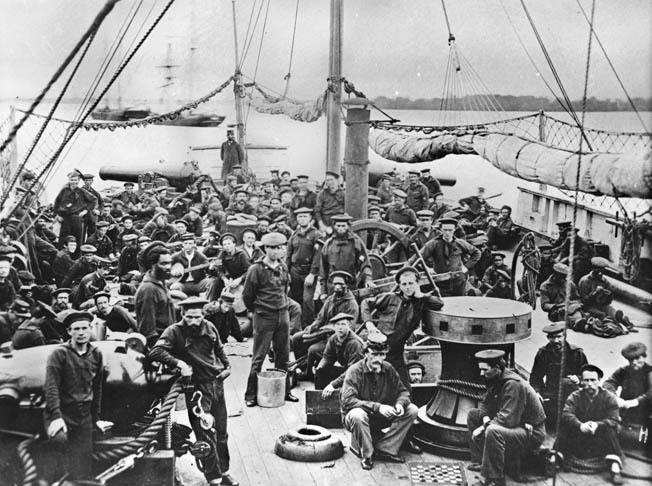 Sailors and Marines aboard the gunboat USS Mendota in 1864. All in all, the Marines played a comparatively small role in the ultimate Union victory in the Civil War. Their reputation as the nation’s premier amphibious unit would not reach fruition until many years later, in World War II, when the Corps put into effect in the South Pacific the lessons learned the hard way at Fort Fisher: unity of command, parallel planning, rehearsed landings, and close integration of naval gunfire support. Said one company-grade Marine officer who had taken part in the botched attack at Fort Fisher, “The war was our great opportunity, and we owlishly neglected it.” The Marines would not neglect their even greater opportunities at Guadalcanal, Tarawa, Iwo Jima, Okinawa and other Pacific stepping stones eight decades later. In that way, at least, their losses in the Civil War had not been in vain. Tags 54th Massachusetts Regiment, Abraham Lincoln, Admiral George Dewey, Ambrose Burnside, andersonville, Battle of Fort Fisher, Battle of Mobile Bay, Confederacy, David Farragut, Fort Sumter, Fort Wagner, general pierre gustave toutant beauregard, J.E.B. Stuart, James Buchanan, John A. Dahlgren, John B Floyd, John Brown, John G. Reynolds, Mathew Brady, medal of honor, Rappahannock River, Richmond, Robert E. Lee, Robert Gould Shaw, Samuel Du Pont, Sandy Hook, Simon Cameron, Spanish-American War, Union Army, United States Marine Corps, USS Galena, William Russell, William T. Sherman.